The figure used for this unit is a Star Wars figure from the Force Unleashed set. 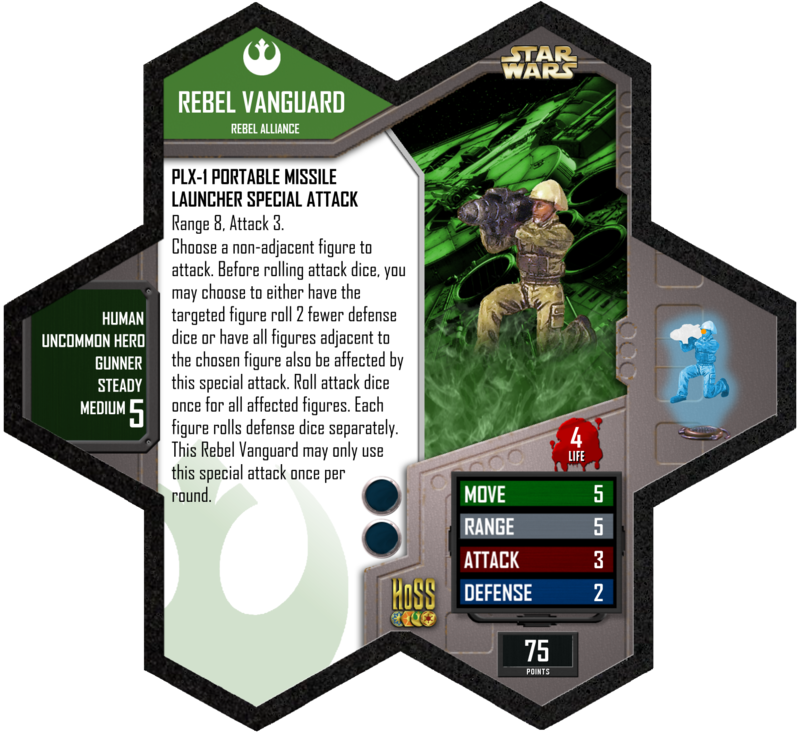 Its model number and name are #23 Rebel Vanguard. Being a non-droid or vehicle hero that follows the Rebel Alliance, the Rebel Vanguard may benefit from 2-1B's REBEL FIELD MEDIC special power. Being a Gunner who follows the Rebel Alliance, the Rebel Vanguard may benefit from Major Derlin's CHIEF OF SECURITY special power. Last edited by Porkins; May 4th, 2017 at 01:00 AM. Choose a non-adjacent figure to attack. Before rolling attack dice, you may choose to either have the targeted figure roll 2 fewer defense dice or have all figures adjacent to the chosen figure also be affected by this special attack. Roll attack dice once for all affected figures. Each figure rolls defense dice separately. 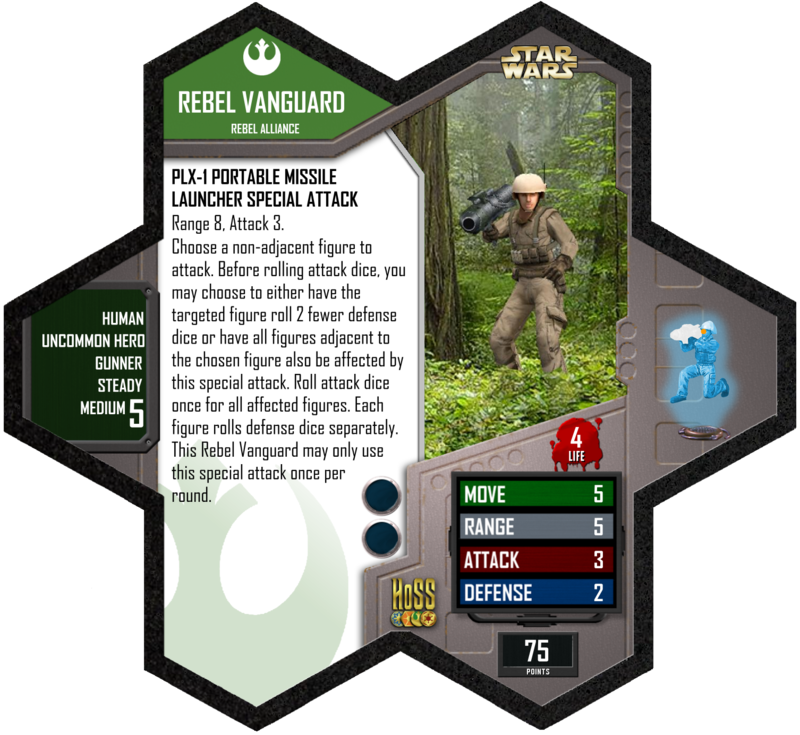 This Rebel Vanguard may only use this special attack once per round. Last edited by Porkins; April 12th, 2017 at 10:20 AM. I haven't tried it, but a couple of these guys in an Ewok build with C-3PO could be a lot of fun. On a map with trees, I would take Logray. Big explosion, little explosion, lots and lots of Special Attacks. Otherwise Scouts to keep regerating Ewoks. That's right, but the rules about Uncommon Heroes say they are treated like Unique Heroes except for the fact that you can have more than one. So they can be used for the bonding with the Ewok Hunters.